Over Rs. 7 million was awarded to Esports athletes in 2018. This is a significant jump in cash money awarded compared to previous years, mostly due to Dialog Play Expo organised by Gamer.LK featuring a prize pool of Rs. 5 million. Along with Dialog Play Expo, the SLT Esports Championship also featured a Rs. 1 million prize pool, and with smaller tournaments like the SLT Cafe Challenge series and Mobitel X-Station tournaments round out the Rs. 7 million figure. You’d find it hard to find any other sporting tournament in Sri Lanka with a Rs. 5 million prize pool. 2019 is looking like it’s going to continue the upward growth and break more records! 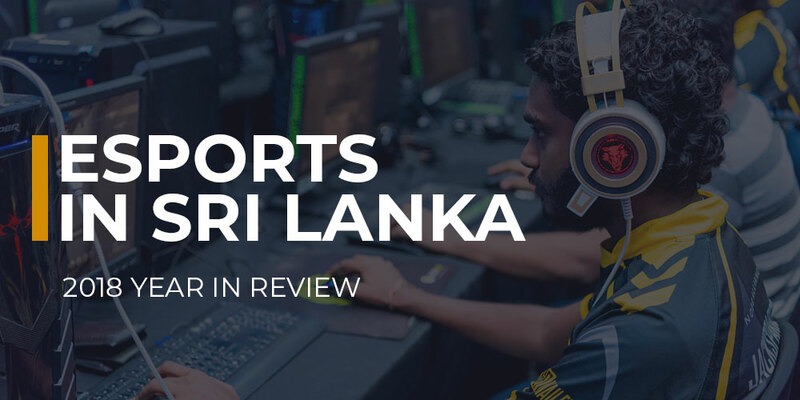 We counted 39 Esports tournaments held in 2018 that were recognised by Gamer.LK and the Sri Lanka Esports Association. Participation in those tournaments amounted to 10,000 registrations, with 160 of those being female. While 160 is less than 2% of total participation, it’s a significant improvement over previous years largely thanks for initiatives by Gamer.LK like the women’s league to promote female participation in the sport. 21 Esports titles were played competitively in 2018. To figure out what the most played Esports titles are we took total participation numbers across all tournaments and divided it by the number of tournaments featuring that title – this gave us an average number of participants per tournament, per title. PC was the most popular platform with 78% of participants playing titles on PC, 23% on mobile and just 5% on console. This year we were able to send eight Esports athletes abroad to *officially* represent the country with the support of the Ministry of Sports and the National Olympic Committee. This was for the 18th Asian Games held in August 2018. Sri Lankan Esports athlete Amruth Alfred beat the rest of South Asia to qualify for the main games in Indonesia where he faced off against the best Starcraft 2 players in the world! In 2018 we paid out over Rs. 600,000 in fees to our referees, casters and event coordinators. This was a 3x increase compared to the year before. It’s a good time to be in Esports as that number is going to go through the roof in 2019 as we ramp up our activities with full-time staff and mega-events! Stick with us as we bring you a record breaking 2019 for Esports!